Archangel Raphael - I HEAL! Archangel Raphael, make me whole again! 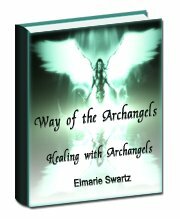 I call on Archangel Raphael as a guide in my healing sessions. 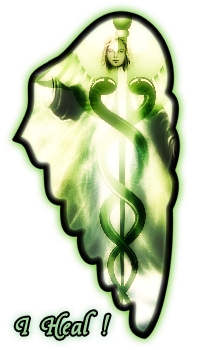 I trust Raphael as he is known to guide human healers (both traditional and alternative) in knowing which earthly treatments or energies to use on their patients. This mighty Archangel is the angel of healing. His name means "God has healed" and is based on the Hebrew word "rapha" which means healer or doctor hence he is also known as the physician of the angelic realm. He is a very powerful healer and is charged with the healing of our beloved Mother Earth, Gaia and all of her inhabitants. Not only does he conduct general spiritual healing directly upon the ill or injured but when working with you, the individual, Raphael begins with purifying your mind and erasing false beliefs because, as I am sure you are aware, it is your thoughts that trigger your health problems, not your body. Learn more about how to invoke Raphael's presence for yourself to clear blocks within your own or someone else's energy body so that the flow of universal life-force energy can heal both the cause of the block and its physical manifestation. Health and vitality are your natural state of being. Their presence today is as strong as it always was and with your knowledge and skills you can working in tandem with them to co-create for yourself and and anyone else . I ask Archangel Raphael to guide me with clarity and love in the process of performing a healing either on behalf of another person or for myself, remember at all times he cannot interfere with another persons' free will. Physical Associations Equalizes calms and relaxes, encourages personal growth, balances physical and mental energy. Spiritual Gifts Wholeness, healing, abundance, inner vision, spiritual sight, inspiration of truth. Practical Assistance Healing of body, mind, soul and spirit, inspiration for the study and practice of music, mathematics, science and both traditional and alternative medicine, meeting physical needs such as food, clothing, shelter, tools of your trade. World Service Repairing of rifts between people, healing of those injured on the battlefield, inspiration for new cures for diseases. NOTE:Archangel Raphael and the Green Ray is a general healing energy but works very well with tension headaches, migraines, gastric ulcers, digestive upsets, agitated emotional states and stress in general. Can help in easing problems with the heart, lungs and thymus. Keeping the archangels close to you is as easy has having their image in places where you will see them. Place one of these cards in different places in your home where you will be sure to notice them and immediately the power of the archangel will be with you.